Reprinted in 80th Annual Report of Northern Nut Growers Assoc. Current reliance on annual plants for food results in the world’s best soils being rendered sterile and non-photosynthetic for large parts of the growing season, due to the requirements of constant planting and tilling. Developing woody perennial plants for intensive food production is a real possibility. Specific species and systems that would allow food production equal to that of annuals, plus production of wood fiber, are discussed. These models include large scale mechanization and hand labor alternatives. Preliminary yield data are presented. Simultaneous production of food and fuelwood from the best agricultural lands could do much to alleviate fuelwood shortages, and would relieve pressure on the forests of developing nations. This could contribute greatly to stabilization of water tables and soils, and could also contribute further to CO2 capture by undisturbed forests. Temperate woody plants can fix 1.82 X 1013 grams of carbon/106 hectares/year. Planting 1/4 of the present world crop lands to woody plants would result in enough extra carbon absorption to completely counteract the present carbon overload. Intensive worldwide programs to develop woody crops for the differing regions may be the most effective, least expensive, most beneficial response humans can make to the global warming threat. The possibility that woody plants could be further domesticated and grown so as to provide food production equal to traditional cereal crops while simultaneously producing fuel wood promises enormous benefits. Current reliance on annual plants for food results in the world’s most fertile soils being rendered sterile and non-photosynthetic for large parts of the growing season, due to the requirements of constant planting and tilling. Woody plants are genetically much more diverse than annuals, giving us a wealth of variation to select from, and in temperate regions calculations show that woody plants can fix more than 3 times as much CO2 per year as annual grains such as maize. In the paper presented last year to the North American Conference on Preparing for Climate Change, I pointed out many of the theoretical considerations which indicate that such development is possible (1) , and gave details of specific plants and cultivation systems which would allow food production equal to that of annuals, plus production of wood fiber for fuel or other uses. These models include both large scale mechanized systems and “human powered” alternatives. Co-production of food and fuelwood from the most productive agricultural lands could do much to alleviate fuelwood shortages, and would relieve pressure on the forests of developing nations. This could contribute greatly to stabilization of watersheds, water tables and soils, and could also contribute further to CO2 removal by allowing forests to grow undisturbed. Calculations indicate the presently highest yielding (temperate) woody plants can fix 1.82 X 1013 grams of carbon/106 hectares/year. Since there are some 1,500 X 106 hectares under cultivation in the world, conservative calculation leads to the conclusion that planting 1/4 of world crop lands to woody plants would result in 5 X 1015 g of carbon (5 gigatons) absorbed above that absorbed by present crops, enough to completely counteract the CO2 overload. Development of woody plant crops is possible. Intensive worldwide programs to develop them for the different climatic regions may be the most effective, least expensive, and most beneficial response humans can make to the global warming threat. This paper will deal with some benefits to climate and environment not covered in the previous paper, and also with some social aspects of making such a large change in agricultural practices. Because woody plants have permanent leaf supporting branches, in the early part of the growing season they do not have to grow their photosynthetic collecting structure. In temperate regions, much of the annually available sunlight strikes the earth before annual crops have enough foliage to intercept it. 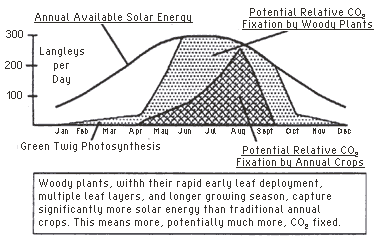 Consequently, woody plants are intrinsically much more efficient collectors of solar energy. Even in tropical regions where more than one crop per year is raised, substantial amounts of sunlight fall on the bare fields required by traditional plowing and planting, and woody crops could certainly be of great benefit there (4) . The two species I personally work to develop are chestnuts (Castanea) and hazelnuts (Corylus), which are well adapted in temperate regions. Their seeds could easily be substituted for all needs currently filled by maize and soybeans. Both of these crops can be developed for either mechanized or hand labor technologies. For mechanization, they would be planted solidly in a field, grown as bushes, not trees, in such a fashion that they could be harvested by a combine machine, similar to those currently used for maize or soybeans. Following the harvest of the seed, it would be possible to also harvest the woody stems mechanically, right down to the ground. The wood can be used for fuel or industrial processing; the established root systems will rapidly grow new tops and will bear a seed crop in one or two growing seasons, depending on the circumstances. Such a crop system is already in commercial use for raspberries (Rubus), and on a limited experimental basis, I have now demonstrated the possibility of such cropping for both chestnuts and hazels. The other alternative is a more traditional “agroforestry” approach; where trees are grown in orchard formation, seed is gathered either by hand or mechanically, and the land area between trees is either grazed by animals or intercropped. Machinery to mechanize production and planting of woody plants for such large scale use already exists. There are several benefits and important impacts that woody agriculture would yield which are not covered in my previous paper. Converted into terms of carbon released to the atmosphere, the range becomes 4.8 to 4.0 X 1010 grams carbon/106 hectares. Calculations for the different operations involved in soybean production came out lower, within the same range. This calculation does not include secondary reductions in fossil fuel use due to the cost of transporting machinery to the fields, reduced lubrication and maintenance of machines, reduced manufacturing costs due to longer machine life, and reduced fuel needed to produce and transport the diesel fuel itself. It is probable that such reductions would amount to an additional 10–15%. Reduction of draft animal energy costs, and animal methane production. In areas where tillage is accomplished with draft animals, there would be a significant reduction in the burden of caring for and raising feed for draft animals, since power needed for harvest is a small fraction of that required for plowing. Fewer draft animals could mean less animal methane production, a significant factor in greenhouse warming, and perhaps more protein available for human consumption. Woody plants not only stop erosion, but actually build soil, by bringing nutrients up from deep soil and rock, and adding them, via leaf litter, to the topsoil. Since the soils are not tilled, they are less compacted, and will absorb more rain without run-off: significant both in capturing water in the soil for later use, and in decreasing the likelihood of flooding. Woody agriculture should both require less fertilizer and result in less run-off pollution. Fertilizer is not likely to wind up in the water supply: with extensive deep permanent roots, woody plants should capture almost all nutrients applied. Since much fertilizer is applied to annual crops when they have small, undeveloped roots, it is easy for rain to simply wash it away, or carry the fertilizer below the roots, where it can find its way into the water table. The escape of some of the applied fertilizer often leads to the application of more fertilizer, in turn leading to more costs and greater likelihood of water contamination. It is worth noting that the actual fossil fuel requirement for nitrogen supplied to maize in the US is 3–4 times the cost of tillage. Reduction in fertilizer requirements represents another large potential direct reduction in fossil fuel burden. Simultaneous production of food and fuelwood. The fuelwood shortage is a major crisis in developing countries, and places heavy burdens both on the people who must struggle for enough fuel to cook their food, and on their overtaxed forests. The destruction of forests also leads to degradation of soils, greater floods, loss of biological diversity, less photosynthetic capability of forests to counteract the CO2 buildup, and ever decreasing fuelwood supplies. Many agencies are advocating the planting of more trees to counteract the greenhouse effect, but in most cases those suggestions are limited to the planting of trees on otherwise unproductive lands. The development of woody agriculture would allow us to utilize the best soils, producing the same amount of food currently produced,while simultaneously producing very convenient and substantial quantities of fuelwood. Woody plants are less sensitive to minor drought. Many of the projections for climate change include the possibility that areas now under cultivation may be subject to increased drought. Annual crops are very sensitive to drought during germination and establishment of the crop; a brief dry spell may delay germination or growth and result in very substantial crop losses. Once more, because of the large permanent root system of woody plants, such brief droughts will commonly have no effect at all on the final yield. While this factor is important everywhere, it is particularly devastating for the developing nations to have to deal with extensive crop failure. When all resources are already being stretched as far as they will go, having to import food means fewer schools, hospitals and new business enterprises. Recurrent crop failures can eventually destabilize national economies and even political systems, resulting in upheavals which can only further retard the progress of the country. Woody crops are by no means immune to long droughts; but they are less affected by minor fluctuations, leading to some increased stability in food supply. Woody agriculture does not necessarily require the extensive application of expensive “high technology.” While it can be developed as a highly mechanized system, it is also possible to develop crop systems which would rely on traditionally available labor. It should not be imagined that woody crops represent a magic solution to all difficulties. Many requirements of food production will remain the same, and it is possible there may be new problems associated with the different treatment of the land. Intensive, high-tech breeding will be required to develop plants suitable for these crop systems. Fertilizer will still be required for good yields. Insects, weeds, and other pests must still be controlled. Mammals and birds are likely to become more important as pests. One benefit of standard tillage is that habitat for small mammals is constantly destroyed in crop fields. Birds and mammals are quite likely to find untilled fields covered with bushes or trees to be quite attractive, however. Some of them will prove beneficial, but others will certainly feed on the bark, foliage, and seed, and in some cases control will probably be necessary. Integrated Pest Management technology should prove effective. On the positive side, the improved habitat for small animals could provide increased biological diversity, and could yield some direct benefits to humans. Response to newly evolved plant diseases will be slower than for annuals. Currently, for annual crops, we attempt to stay ahead of new plant diseases by maintaining collections of diverse and hopefully resistant germplasm. When a new disease is identified, annual crops can be rapidly bred which will incorporate the necessary resistance. Then the new seed is increased, and in a relatively short time, perhaps only a year or two, will be available for planting. For woody plants, the same basic process must be used. Breeding of woody plants can be done just as rapidly as for annuals (when the necessary precocious strains are developed (1) ) , and the new resistant plants rapidly increased. However, there will always be a 2 to 3 year wait after planting before the new fields will bear a crop. Two actions will counter these difficulties. First, plantings of woody crops should never be allowed to become genetically uniform, regardless of economic pressure to plant only the most productive varieties. While a single field will probably consist of 1 or 2 clones, it should be a matter of policy that the plantings in a region should be as genetically diverse as possible. In this way the probability of a new disease attacking all fields will be substantially decreased. Second, a field destroyed by a new disease certainly need not be left unproductive. Annual crops can be planted to provide food production while woody replacements are being developed, and annuals can be intercropped while the new woody plants are growing to productive size. Acceptance of new crops has been a problem in the past. In some cases, newly developed high yielding cereals have been rejected by those they were intended to benefit because the taste was unacceptable. There should be no particular difficulty with achieving acceptance of crops from woody plants; in most cases they will be derived from plants which are already accepted in the regional cuisines, and are often considered delicacies. In any case, new crops can achieve widespread acceptance when economic or other factors are compelling: witness the fact that 40 years ago, no one in the US grew soybeans; now, however more than 25 million hectares are planted there every year. Woody agriculture is not merely theory. I have personally been collecting, screening and breeding hazels and chestnuts for 9 years with these goals in mind, and the work of many other researchers could also be applied to this concept. At this point in my own investigations I am convinced woody agriculture will work, based on genetic variants found and created, and on yields already achieved. This past year one of my hazel selections, G-228-S, produced a crop which, rather conservatively extrapolated for a field planted to this one cultivar, would have yielded about 2,250 kg of kernel/hectare (nutshells excluded) (5) . For comparison, soybeans, the crop most comparable, yield an average of about 2,100 kg/hectare in the US. This plant was 8 years old, grown in a situation most amenable to hand harvesting. The crop was borne in spite of extreme drought and no fertilizer in 1988, and severe drought in 1989. Another selection, G-105-N, was cut to the ground in early spring of 1988 (i.e. the wood was harvested), re-grew without fertilizer and in extreme drought, and in 1989 bore the equivalent of 764 kg of kernel/hectare. The lush re-growth of the plant demonstrates further potential for shunting photosynthate into seed production, and away from wood. This selection represents only the very crudest and earliest attempt to identify plants capable of bearing seed quickly after having the wood harvested. The amount of kernel produced by a plant may be limited by the number of female flowers it can set. Most hazels set an average of 3–5 nuts per cluster, but I have been able to identify some individuals which typically set much more; up to 14. The potential is here to develop a hazel which bears seed almost in “cobs,” rather like maize, greatly facilitating harvest. Progress has also been made with chestnuts: Ultra-precocious multi-species hybrids have been made which are able to flower and produce useful pollen only 3–4 months after the germination of the seed. This can tremendously accelerate breeding projects aimed at transferring genetic traits from one line to another. Perhaps most significantly, during a recent trip to the People’s Republic of China, the Hubei Academy of Agricultural Sciences requested a seminar on the subject of woody agriculture which generated great interest. At their request, I now have an agreement with scientists in the Academy to cooperate in the continuing development of chestnut for woody agriculture, and I will be sending them, next year, some of my more advanced chestnut strains for them to begin making woody agriculture type plantings in the PRC. They will also be cross-breeding my strains with their own, to further develop the crop potential, and we will continue to exchange visits, work, ideas, and genetic material. The Chinese are now interested in developing other woody crops along these lines. While there I was introduced to a plant new to me, the “camellia oil” bush. This is a relative of tea, traditionally grown for the oil pressed from the large seed, but never developed much beyond very basic selection of slightly more productive wild bushes. In a few years of work, however, the Chinese scientists have already, through simple use of pruning, grafting, and fertilizing, increased the traditional yield of the crop by 150%. The great potential for further yield gains by cross breeding their best selections is the next avenue they are going to explore. “Camellia oil” is a perfect example of potential woody agriculture crop plants, already used traditionally, but virtually unimproved. Such plants exist in every region of the world, awaiting our attention. In order to be most effective, the development of woody agriculture should proceed simultaneously in many parts of the world, with many different species of crop plants. It may be helpful to point out some factors which will increase the success of new woody crops. The crop product must be a fruit or seed which can be easily preserved and stored in bulk, in common storage facilities, like those for cereals and pulses. Perishable and fragile fruits are not desirable. The plant should be one which re-grows rapidly and easily after it is cut down. Species which naturally grow in dense stands, or thickets, will probably prove more disease resistant when planted in uniform fields than those which naturally grow widely separated from other trees or bushes of the same species. Thicket forming species may also be better adapted to growing well in crowded, competitive conditions. In order to develop a new crop species, it will be necessary to find or breed strains of the plant which produce seed at a very young age. I have found and bred hybrid chestnuts which produce pollen only 4 months after germination of the seed; similar precocity can be achieved in most species, but finding the most naturally precocious material to start with will greatly speed the process. It would be best to select potential crop plants from among large plant families. In this way access to much larger genetic variability, through inter-species hybrids, can be made available to breeders. Choosing a plant with no close relatives will limit the potential of the crop. Could woody agriculture be part of a planned response to the possibility of global warming? Certainly, but it is a practice with a very long lead time. The following are my own optimistic guesses about how long it would take for extensive plantings of woody crops to make a significant impact on global CO2 concentrations, provided an organized effort were mounted to make this strategy work. Inevitably, this seems like an impossibly long time. However, when considering the slowness with which the globe reacts to any changes, this is actually quite a reasonable response to consider. A significant factor on the side of using woody agriculture as a response to global warming is the fact that the other environmental benefits of the concept are so large that it is worth undertaking for those considerations alone, regardless of whether one believes in the inevitability of global warming. It should not be nearly as difficult to “sell” as cutting back on “development” and economic growth. It might actually be an important factor in making “sustainable development” a reality, rather than a hope. Since it is the goal of this meeting to produce action, rather than mere discussion, I include the following requirements if woody agriculture is to be part of the world response to the climate change threat. Some organization needs to take responsibility for spreading the concept, and educating regional scientists of the possibilities and benefits. I have already stimulated a research and planting program in China, but similar programs need to be initiated around the globe. Number one requires money. It must be found if progress is to begin. There are excellent agricultural research organizations, both public and private, around the world. If they can be genuinely interested in pursuing woody agriculture, an enormous amount of work can quickly be accomplished. While waiting for numbers 1–3 to be accomplished, interested workers can begin now the task of identifying and planting working collections of woody plants potentially adaptable for intensive cultivation in their own regions. Woody agriculture, the intensive production of staple foodstuffs from woody plants, has real potential to significantly offset the buildup of atmospheric CO2. Present estimates of the annual increase in atmospheric carbon are around 3 gigatons; if woody plants could be substituted for the traditional annual crops now being grown on ¼ of world crop lands, they would fix an additional 5 gigatons of carbon per year, with no decrease in food production. In addition, the fact that woody crops would not require plowing, planting, or cultivating (after initial establishment), means that when substituted for mechanized crops, they would not require between 4.77 × 1010 to 3.38 × 1010 grams carbon/106 hectares planted in diesel fuel (fossil carbon) currently expended for those operations. Yields of food from woody plants, measured on an experimental basis, already equal, and may surpass, yields from soybeans. In addition to the food produced, fuelwood may also be harvested from the same plantings, alleviating pressure on remaining forests. Rutter, P.A. 1989. Reducing Earth’s “greenhouse” CO2 through shifting staples production to woody plants. Proceedings of the Second North American Conference on Preparing for Climate Change, Washington DC, December 6–8, 1988. The Climate Institute. Fuller, Earl; Bill Lazarus and Dave Nordquist. 1989. Minnesota farm machinery economic cost estimates for 1989. AG-FO-2308. Minnesota Extension Service, University of Minnesota. St. Paul, Minnesota. Moncrief, J.F, J.A. True, & M.L. Mellema. 1987. Tillage, Energy and Yields for Corn and Soybeans. AG-BU-3290. Minnesota Extension Service, University of Minnesota. St. Paul, Minnesota. Phillippine Council for Agriculture and Resources Research; and (US) National Academy of Sciences. 1977. Leucaena; promising forage and tree crop for the tropics. 115 pgs. National Academy of Sciences, Washington, DC.